Hey lady loves! I'm working hard to announce a winner of my giveaway tomorrow, I don't have Excel on my home comp so I have to do what I can at work on my lunch break. I've had these gorgeous little Hello Kitty Chanel water decals in the closet and figured it would be a good time to bust 'em out. Welp let's just say my fingernails are way too tiny for these (at least with painted tips). I used a BC and two coats of Sally Hansen Star Opal Nail Glaze in Pale Lilac Opal. It's a very sheer micro pink shimmer. I then used two coats of the famous China Glaze Ruby Pumps to free-hand tips. I then free-handed the smile line with So Easy Stripe Rite in black. While the water decals were fairly simple to apply and slide around, they just didn't fit nicely on my cuticle. I added two coats of Seche Vite topcoat hoping it would glue those little babies down. It worked for a few hours but as soon as I woke up this morning they were looking pretty beat. I couldn't stand the feeling of the edges coming up on my nail and took it off as soon as I got home. Luckily I have 13 more so I think I can at least use them for a thumb or index accent. Have you used water decals that were difficult? This is way cute but I can understand the lifting thing at the cuticles. I've had that problem with regular stickers on my nails and I take them off as soon as i can! Not a fail, really good! its soooo not a fail. im totally loving it !!! Danielle - It looked ridiculous the next morning, all the stickers were half-way off my nail. 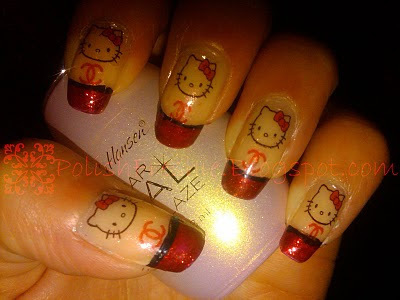 I bought them on eBay, just good hello kitty water or nail decal. Aww thanks girls, of course they look perfect in the picture but I assure you real life was very different. I really liked these too =(. This really came out great!! I love Hello Kitty!!! Cute! Too bad the decals were too big, though, 'cause sporting this mani for a while would've been great! I don't see it as a fail. I really like this. Makeup ~ Anything Hello Kitty is just too cute to resist! !